The closest railway stations are Montepulciano Stazione and Chuisi-Chianciano Terme Stazione, both on main railway networks. 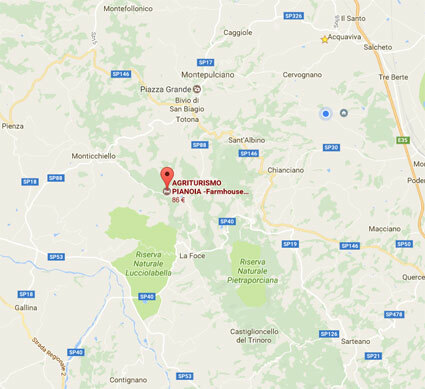 The closest bus stations are Montepulciano and Chiusi-Chianciano Terme, both well serviced and linked to main bus networks. On the A1 motorway heading south towards Naples (Napoli) / Rome (Roma), take the Valdichiana exit (signposted Bettolle) and then follow signs for Montepulciano. Passing through Montepulciano, begin to follow signs for the SS 146 towards Chianciano, turning right off this road at the signpost for Monticchiello. Continue along this road, turning right at the intersection again signposted Monticchiello (SP 88). Continue for a short distance and Agriturismo Pianoia is on the right hand side, before the woodlands. On the A1 motorway heading north towards Milan (Milano) / Florence (Firenze), take the Chiusi-Chianciano Terme exit. Follow signs for the SS 146 passing through Chianciano Terme and then following directions for Montepulciano. Turn left at the signpost indicating Monticchiello (SP 88). Continue along this road, turning right at the intersection again signposted Monticchiello (SP 88). Continue for a short distance and Agriturismo Pianoia is on the right hand side, before the woodlands.